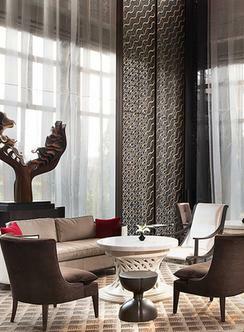 Part of the Luxury Collection Hotels, the Keraton is a lavish five-star hotel in the heart of Jakarta. 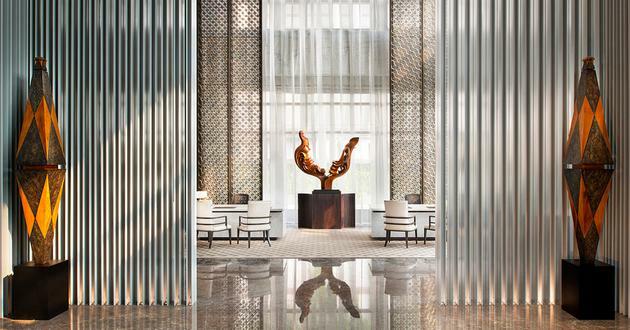 SCDA’s scope extended to the main arrival plaza and the grand lobby of the hotel. The name Keraton, meaning palace in Indonesian, urged us to fashion a truly palatial arrival experience. As one approaches the main drop-off, a large stone water feature mirrors the glass doorway flanked by two screen walls, also immersed in a reflective pool. 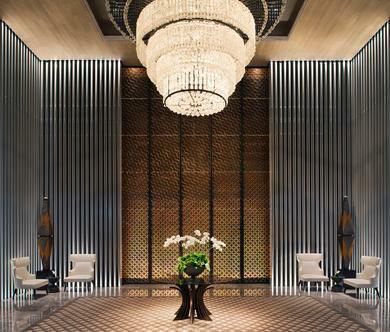 The screens are repeated throughout the grand lobby, creating a unified entrance sequence. Skilfully crafted, they combine antiqued and golden bronze, creating a double pattern that becomes transformed by light: during the day, the sunrays expose the undulating golden pattern; at night, the warm backlight reveals the antique bronze latticework. 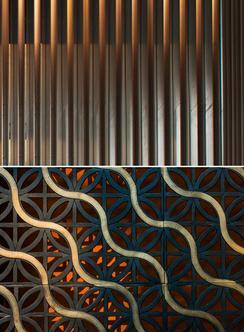 These highly decorative screens are paired with another type of screen made up vertical brushed aluminium fins. 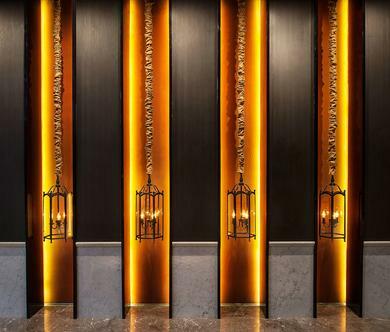 Together, these elements emphasize the verticality and symmetry of the lobby space, juxtaposing traditional and contemporary ironworking techniques to create a signature look for the hotel.